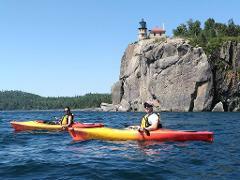 This unique experience combines big water paddling on Lake Superior, epic views of Split Rock Lighthouse, and North Shore exploration in a fun-filled day trip with The Duluth Experience crew. This all-inclusive adventure is designed for all skill levels. Our knowledgeable and friendly guides will provide instruction on paddling techniques and water safety while guiding you on an epic paddle to Lake Superior's historic Split Rock Lighthouse! This adventure will give you a chance to explore Lake Superior's rugged coastline with experienced guides who share your passion for the outdoors.